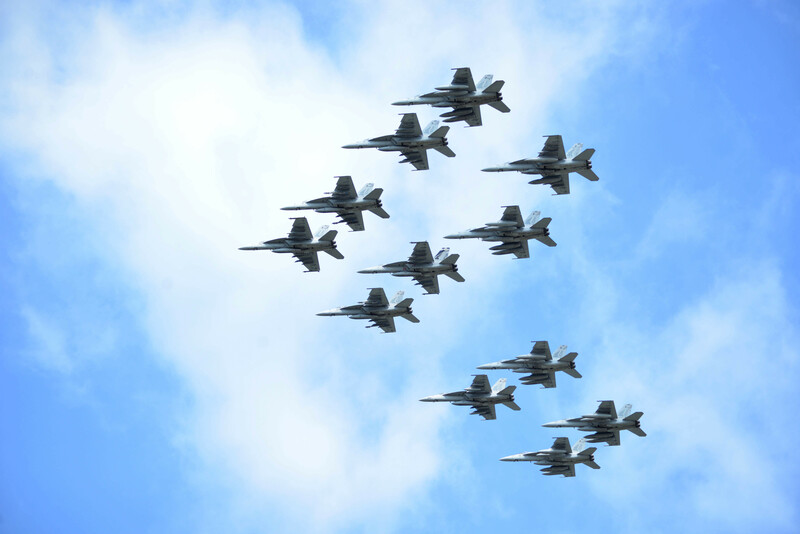 The “Pukin’ Dogs” of Strike Fighter Squadron (VFA) 143 perform a flyover in formation during a homecoming celebration at Naval Air Station (NAS) Oceana on July 12, 2016. US Navy photo. THE PENTAGON – The White House released its Fiscal Year 2017 supplemental funding request today, which had been touted as being focused on gaining near-term readiness but may come too late to fully support operations and maintenance additions in this current year. This spending request was meant to “address urgent warfighting readiness shortfalls across the joint force,” Defense Secretary James Mattis wrote in a Jan. 31 memo. For the Navy, that would have meant putting more surface ships into maintenance and modernization availabilities at private shipyards; addressing a backlog at public shipyards through hiring and training additional workers and seeking support from private yards; buying more spare parts for airplanes to reduce the number of aircraft down for maintenance, and subsequently paying for more flight hours as aircraft readiness rates rose; investing in the shore facilities, particularly the aging drydocks and piers that support ship readiness; and more. 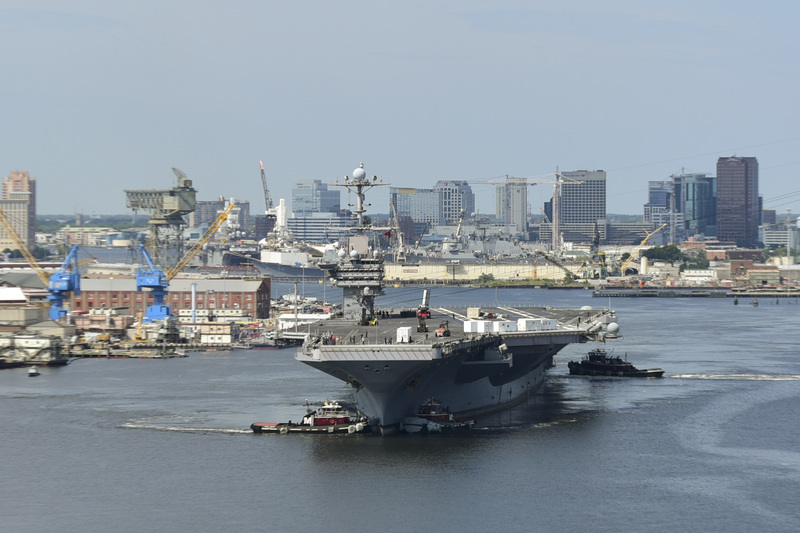 Aircraft carrier USS Harry S. Truman (CVN 75) transits the Elizabeth river from its homeport at Naval Station Norfolk to Norfolk Naval Shipyard on Aug. 25, 2016. US Navy photo. In its most recent wish list, called an unfunded priorities list, the Navy said it needed more than $2 billion for afloat readiness and $803 million for shore readiness if the money were to become available through supplemental spending. The supplemental bill, though, only requests $1.7 billion for Navy operations and maintenance to support readiness this fiscal year. The supplemental does not specify what exactly these readiness dollars would pay for, and the Pentagon and Navy could not immediately provide that information. On the other hand, the Navy’s portion of the supplemental spending bill devotes $5.8 billion to support mid- to long-term readiness through acquisition of 24 F/A18-E/F Super Hornets, six more P-8A Poseidon maritime patrol aircraft, two more MV-22 Ospreys, and other planes and munitions. The same is true for all the services, with the supplemental buying a total of $13.5 billion in procurement for the joint force as a whole compared to $7.2 billion in operations and maintenance. The reason for not providing the full readiness funding, the acting Pentagon comptroller said, is that the money may come too late to add maintenance availabilities, exercises and other immediate readiness-boosters. “We are almost halfway through this fiscal year,” John Roth told reporters at the Pentagon today. Roth said the bulk of what was on the services’ unfunded priorities list that couldn’t be executed in time was operations and maintenance funding – which was the Navy’s stated priority. 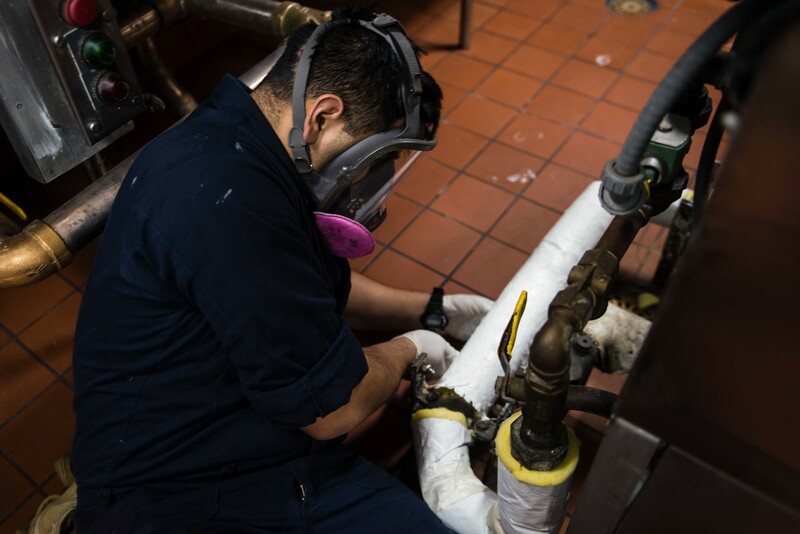 Damage Controlman Fireman Chris Arteaga installs lagging material, used to protect and insulate pipes and fittings, on a steam pipe in USS John C. Stennis’ (CVN 74) crew scullery on Feb. 23, 2017. John C. Stennis is conducting a planned incremental availability (PIA) at Puget Sound Naval Shipyard and Intermediate Maintenance Facility, during which the ship is undergoing scheduled maintenance and upgrades. US Navy photo. In recent years, the services submit their budget requests to lawmakers through the secretary of defense but also directly submit an “unfunded priorities list” that lets lawmakers know what else they need that couldn’t fit into the budget based on Pentagon priorities and expected available dollars. The Navy submitted a list along with the FY 2017 budget last spring and then updated it in January. Its main message then was readiness: “Our priorities are unambiguously focused on readiness – those things required to get planes in the air, ships and subs at sea, sailors trained and ready,” a Navy official told USNI News at the time. “You’ve got to remember, these unfunded requirements lists were generally developed with the thought of an annual appropriation in mind. They’re normally provided to Congress along with the rest of the budget,” Roth told reporters. In addition to the emphasis on readiness, the Navy’s unfunded priorities list had included billions of dollars of procurement needs: about $4 billion in aircraft procurement, $3.4 billion in shipbuilding, $453 million for weapons, $114 million for cyber investments and more, USNI News previously reported. The Navy and Marine Corps procurement items in the 2017 supplemental spending request come directly from that list and focus primarily on aircraft and weapons procurement. The request outlines $2.3 billion for 24 Super Hornets, $920 million for six P-8 Poseidons, $208 million for two C-40A transport planes for the Marine Corps, and $171 million for two MV-22 Ospreys for the Marine Corps. On weapons, it includes $85 million for 96 Tomahawk missiles, $43 million for an unstated number of Standard Missiles, and $77 million for 515 Javelin missiles. It also includes $433 million to complete the purchase of an Arleigh Burke-class guided-missile destroyer that the Navy has partially paid for, and $190 million for three Ship-to-Shore Connectors. Of note, though, the request left out two F-35C Joint Strike Fighters the Navy had asked for, as well as support for six shipbuilding programs. “Now you’re looking more mid-term, long-term readiness as we get a leg up on trying to fill some of the holes in the inventory from the gaps we have,” Roth said of the procurement funding. Overall, the supplemental requests $25 billion in base budget defense spending and $5 billion for Overseas Contingency Operations (OCO) spending, plus $3 billion for the Department of Homeland Security. This funding would be added on top of the rest of the FY 2017 spending bill, which has passed the House but not the Senate. The government is currently running under a continuing resolution that funds each department at last year’s spending levels and has caused headaches for the Navy by having money in the wrong accounts, leaving the service unable to access billions of dollars during the CR. The legislative challenge in passing this supplemental funding measure is twofold. First, Congress has yet to pass the actual 2017 spending bill, and some lawmakers have advocated abandoning the bills altogether and extending the CR until the end of the year, Sept. 30. The 2017 defense spending bill would have to be enacted for this supplemental to make sense. And second, the supplemental – as written – would push defense spending over congressionally mandated spending caps and trigger another across-the-board sequestration cut. Lawmakers could get around this by converting all the spending items to the OCO budget, or by lifting the spending caps – a highly unlikely scenario this fiscal year – but with tensions running high over healthcare and other issues, it remains to be seen whether a consensus can be reached on not only passing the defense spending bill but also passing this additional defense spending. The current CR expires on April 28, so lawmakers will have to decide by then if a 2017 spending bill is politically feasible or if they’ll have to settle for a full-year CR. “We have crying needs in terms of training, readiness, maintenance and all in the operations and maintenance account, so if we have to operate under a full-year continuing resolution, bad things start happening out in the operating world amongst the military departments in terms of our basic train and equip and organize mandate,” Roth said.